Professor publishes book that challenges mainstream thought about social media and sees this new tool as something that reinforces inequity. Most people believe social media to be a great equalizer, challenging social inequities by giving everyone (as content creators) a vehicle for largely unbridled public expression, communication and broadcast. Communications Studies Professor Derek Hrynyshyn, however, has turned this idea on its head in his new book, Limits of the Digital Revolution: How Mass Media Culture Endures in a Social Media World, published by Praeger (2017). Here, Hrynyshyn explores the ways in which social media shapes popular culture and how social power is expressed within it. He compares social media to mass media, both of which are driven by capitalism, and concludes that often social media legitimizes the inequities among the social classes rather than challenges them. He successfully debunks the assumption constructed and perpetrated by Apple superstar Steve Jobs that technological progress equals progress for humanity. Hrynyshyn debunks the assumption constructed and perpetrated by Apple superstar Steve Jobs that technological progress equals progress for humanity. Wikipedia defines social media as “computer-mediated technologies that facilitate the creation and sharing of information, ideas, career interests and other forms of expression via virtual communities and networks.” As each new social media tool has come on to the market ̶̶ Facebook, YouTube, Twitter, LinkedIn and Instagram – it has been readily adopted, on a global level, particularly by millennials. The popularity of social media networks is based on both the number of members and how often the members use the networks because this measures engagement/connections – arguably the most important measurable goal of social media. CanadiansInternet.com tells us how many of the Canadians surveyed in 2016 visit each social network at least twice per week: Facebook 71 per cent; YouTube 49 per cent; Twitter 27 per cent; Pinterest 23 per cent; Google 21 per cent; Instagram 20 per cent; LinkedIn 12 per cent; Snapchat 9 per cent; Tumblr 5 per cent; and Reddit 5 per cent. It is within this context of mass global adoption where Hrynyshyn wanted to stop and take stock of the sweeping uptake of social media, to ask some critical questions about this new tool. “We can only see past the blinders put in place through immersion in a media environment when we put social media in the context of the historical, political and economic conditions out of which they emerged and within which they continue to function,” he says. This is why he needed to delve into the difference between social media and mass media, the relationship between technologies and social change, and the role of popular culture in the structure of political and economic power. In studying Facebook, Twitter and Google, Hrynyshyn started reframing these new tools not as a means for individual expression but as systems of surveillance that monitor everyday activities of users for the benefit of advertisers (generating income) and the networks themselves. “This book considers how capitalism affects the development of social media; explores the use of blogs, Facebook, and Twitter in revolutionary political action and the effects of ‘viral’ campaigns on political culture; uncovers the truth behind privacy infringements on popular cultural industries, and reveals the hidden factors driving the rapid expansion of social media,” explains Hrynyshyn. Importantly, the way Hrynyshyn tells the story is particularly engaging. The ideas evolve naturally through Hrynyshyn’s careful examination of privacy online, freedom of expression, piracy, the digital divide, fragmentation and social cohesion. Hrynyshyn concludes that social media has effectively legitimized the inequities among the social classes. For example, the first four chapters in this ten-chapter book set the stage and provide a theoretical approach to understanding the cultural implications of social media, profiling basic assumptions about media and the structure of social power; while the second chapter challenges popular thinking. Chapter three looks at how media are economically supported, through advertising, and digs deeper into the power relationships underpinning social media. The later chapters look at whether social media solves or creates problems in our popular culture – for example, the need to lower content down to a common denominator where it becomes homogeneous. This book uncovers the truth behind privacy infringements on popular cultural industries, and reveals the hidden factors driving the rapid expansion of social media. One of the most interesting later chapters considers what social media does to democracy. Here, in the context of power relationships, the author considers whether or not social media has helped us overcome social inequity among genders, racial and ethnic groups, and others. He believes the latter: social media has effectively legitimized the inequities among the social classes. For Hrynyshyn, the disconnect, between what existing popular writers tell us social media makes possible and the actual developments in our world and culture, should raise alarm bells. 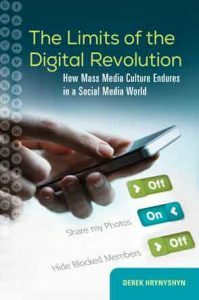 The book, Limits of the Digital Revolution: How Mass Media Culture Endures in a Social Media World, was published in Praeger in 2017. To learn more about Research & Innovation at York, watch the York Research Impact Story, see the infographic poster or visit the YouTube playlist.